Smallholder oil palm farmers around the Bakossi National Park were supported to organize themselves into a Cooperative Society, Tombel Area Oil Palm Faremers’ Cooperative (TAPAFCOOP-BOD). Working with the WWF Business and Industry thematic leader within the SIDA-supported Green Heart of Africa CSO Support Project, EGI contracted the services of a consultant to support the process of structuring smallholder farmers in Tombel Sub-division into a Cooperative Society. 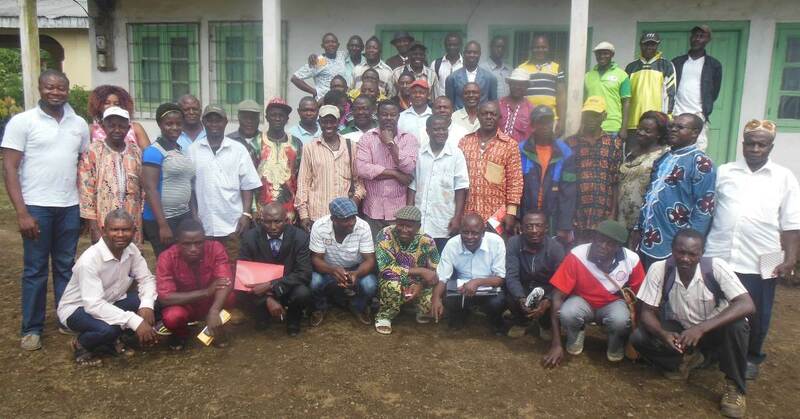 The process started in November 2015 with a consultation meeting between EGI, the consultant and smallholder farmers in Tombel Sub-division. At the 2-day meeting, participants discussed the challenges that they face as smallholder oil palm farmers. Farmers then discussed the idea of structuring themselves into a Cooperative Society, and what their expectations and fears with regards to this idea were. In the next phase, farmers were divided into sections/zones based on the Ministry of Agriculture and Rural Development (MINADER) agriculture posts in Tombel area. They were then asked to conduct elections of delegates for the respective sections. In December 2015, a 2-day training workshop of delegates took place in Tombel. The workshop built the capacities of delegates on the structure of a cooperative, e.g. organs, etc. During the same, elections of board members were conducted in a free and fair manner. Mr. Gabriel Nsom from Ngussi was elected Board Chair. A Cooperative called Tombel Area Palm Farmers’ Cooperative (TAPAF-COOP-BOD) has now been formed.